White House Talks End Without Bailout Deal Top congressional leaders from both parties joined presidential candidates Barack Obama and John McCain at the White House on Thursday for a meeting with President Bush. The aim was to complete a $700 billion rescue plan for Wall Street, but it appears no final deal has been struck. 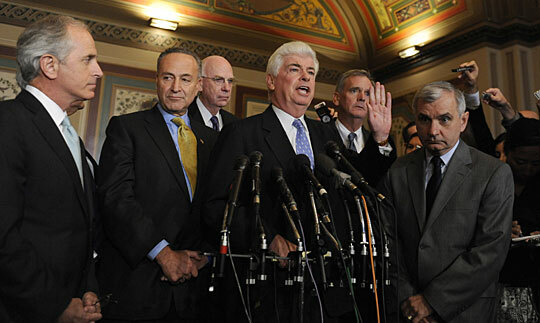 Senate Banking Committee Chairman Christopher Dodd (center) speaks during a news conference Thursday following a meeting on Capitol Hill about the market turmoil. Top congressional leaders from both parties joined presidential candidates Barack Obama and John McCain at the White House on Thursday for a meeting with President Bush. The aim was to complete a $700 billion rescue plan for financial markets sought by the White House, but it appears no final deal has been struck. Lawmakers met with government finance officials later Thursday, but those negotiations also reportedly ended with no deal. Talks were scheduled to resume Friday morning. Earlier in the day, with McCain seated at one end of the long Cabinet Table and Obama at the other, President Bush told reporters allowed in only for the start of the meeting that if bailout legislation is not passed, the country is in a serious economic crisis. "All of us around the table take this issue very seriously, and we know we've got to get something done as quickly as possible," the president said. "And this meeting is an attempt to move the process forward. My hope is that we can reach an agreement very shortly." But when Alabama Sen. Richard Shelby emerged from the meeting Thursday afternoon, the ranking Republican on the Senate Banking Committee told reporters, "We hadn't gotten an agreement." "There's still a lot of different opinions," Shelby said. "Mine is it's flawed from the beginning." 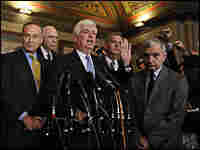 House Republicans are also lined up against the bailout. Earlier Thursday, congressional leaders from both parties announced they had reached an agreement in principle on legislation to authorize the bailout. Congress is expected to vote on the bill within days. The proposed deal would codify many of the basic tenets of the Bush administration's initial plan, released last week, but it includes several key changes. The money would be made available to the U.S. Treasury in stages. Treasury would have access to $250 billion immediately and an additional $100 billion later, "when the president certifies this emergency continues," New York Sen. Charles Schumer said. If needed, the final $350 billion would be available in May 2009, he said. Congress would be allowed to assess the program after the initial payment and block any additional funds if it deemed them unnecessary. The agreement could require all companies participating in the program to agree to limits on executive pay — such as restrictions on "golden parachutes." Schumer said the plan would also give the government a financial stake, in the form of warrants, in all participating companies. Republican Sen. Bob Bennett of Utah said the plan is one that can "pass the House, pass the Senate [and] be signed by the president." Lawmakers said only a few, though potentially problematic, hurdles remain. Among them is a Democratic proposal to alter bankruptcy law in order to give judges the right to change the terms of mortgages. That proposal is hotly contested by the White House, the Treasury and many conservative Democrats and Republicans, who worry such a move would raise interest rates for everyone. The concern is that if judges give breaks on mortgage rates to people in bankruptcy and on the brink of foreclosure, then banks will need to raise rates on everybody else to make up for that loss. Democrat Barney Frank of Massachusetts, chairman of the House Financial Services Committee, said he didn't expect any remaining details to jeopardize the agreement. "We came to agreements on a lot of the important issues," Frank said at the press conference following a negotiating session between House and Senate lawmakers. "There really isn't much of a deadlock to break." Sen. Bob Corker, a Republican from Tennessee, said: "I believe that we will pass this legislation before the markets open on Monday." It's unclear whether Treasury Secretary Henry Paulson will agree to all of Congress' changes. But the Bush administration may not have much wiggle room, considering it has stated so adamantly that a bailout must happen as quickly as possible. The Treasury has proposed that the federal government buy $700 billion of illiquid debt from financial firms. The goal is to calm financial markets by removing the toxic assets, mostly mortgage-backed securities, that lie at the heart of the crisis. Many senior Democrats and rank-and-file Republicans have been wary about the huge cost of the plan and the unfettered power it grants the Treasury secretary to intervene in the marketplace. In a 12-minute televised address to the nation Wednesday night, President Bush warned that action is needed quickly to forestall financial calamity. "Without immediate action by Congress, America could slip into a financial panic and a distressing scenario would unfold," he said.